When I decided to join the Church of Jesus Christ of Latter-day Saints. It was a long hard year making that decision. On the day of my baptism as the meeting ended, I stood at the bottom of the stairs in the chapel, my hair still wet from the font and I shook hands with one of the most influential people in my life. “Well, I did it. It’s over I said.” Brother B looked at me with something in his eyes, I saw happiness, I saw that he was proud of me, I saw support and tenderness, and I could swear I saw a glint of humor. Was he laughing at my stupidity? Smiling at my naivete, or just smirking with the knowledge that he knew something that I didn’t? I planned my whole wedding down to the tiniest detail when I was about 10 years old. Sure my opinions and desires changed over the years, but I kept it updated I was prepared at any given moment to put on the wedding of my dreams in about two weeks flat. I had everything primed and ready, like dominoes all set so that when the time came all I would have to do is push that first one and things would fly into motion. That wasn’t because I wanted to plan my wedding in two weeks. It was just because I was so excited for it that I couldn’t help but do everything to prepare that could possibly be done before you’ve actually met the man of your dreams. That and that I’m a planner. I just enjoy the whole process. 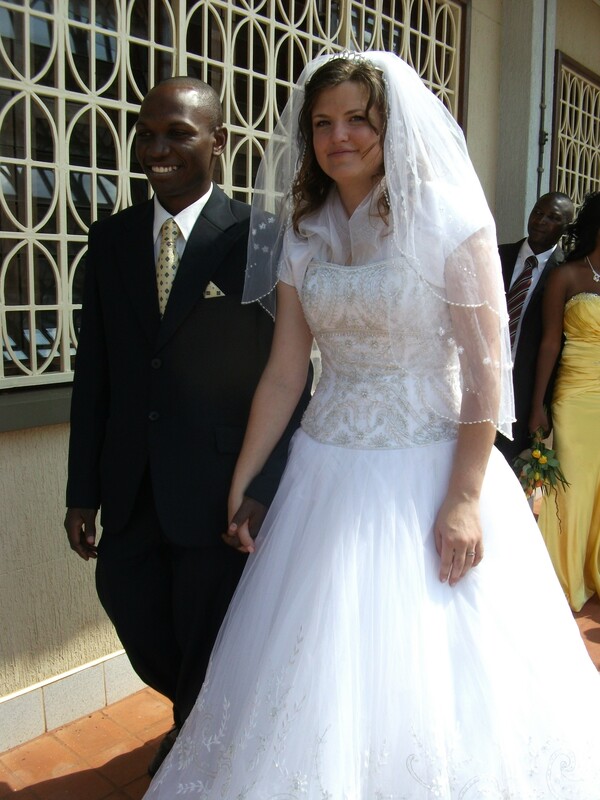 So when Joseph and I decided to change our plans and get married before I left Uganda, I felt I was up for the challenge. It actually meant that I would be planning the wedding in two weeks, but I was ready. 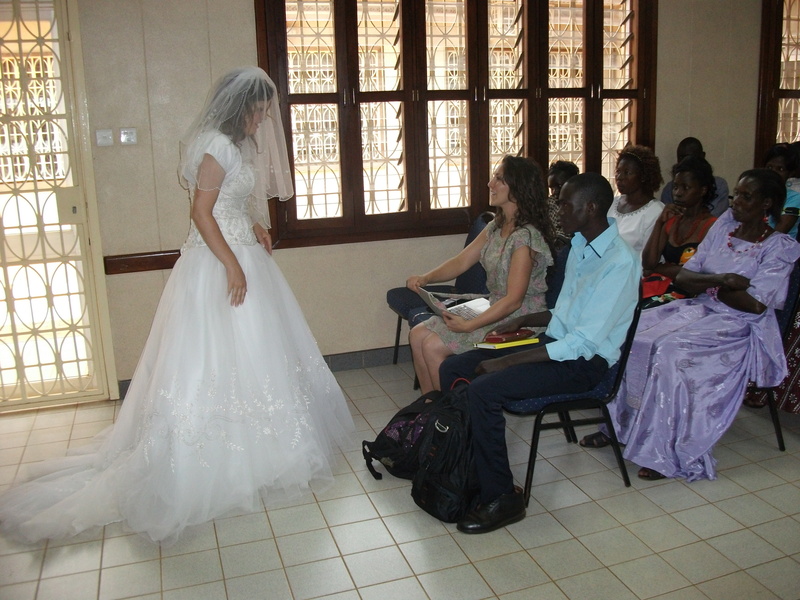 Since the wedding would be taking place in Uganda it meant some minor (cough, cough sputter) changes to my plans but nothing I wasn’t prepared to handle. What I wasn’t prepared for was Joseph’s family. they had ideas, they had traditions, and they had culture that COULDN’T be messed with. Normally I am the kind of person that when I am told that I “shouldn’t or can’t” do something…well thats the first thing I am going to attempt to do. And I usually succeed… or fail depending on how you look at it. 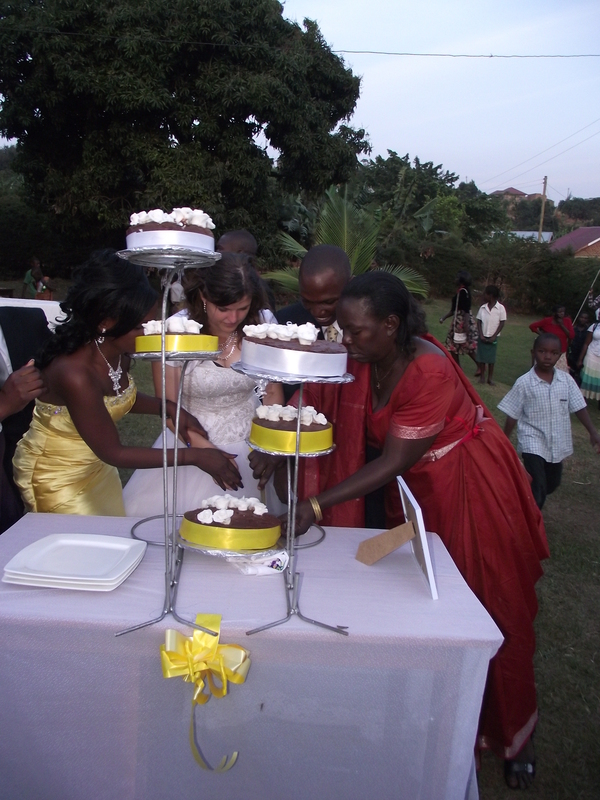 Before I had a chance to say “boo” they had taken the whole affair into their hands, and the wedding was planned. We had tents set up in Uncle’s yard, there were tables and chairs with embroidered cloths, there were ribbons and decorations. There was food prepared, and the word was spread. Literally before I hardly knew what had happened the whole thing was planned. It was a little hard, seeing it all taken out of my hands, and I wanted to protest, and did a couple of times, but realized that by this time I needed to just let it go. I didn’t know what to say, I felt good about progressing I felt good about the steps we were taking, I knew I loved Joseph, but I still didn’t “know” that it was the right thing for me. We met with the new Mission President and begged for counsel. 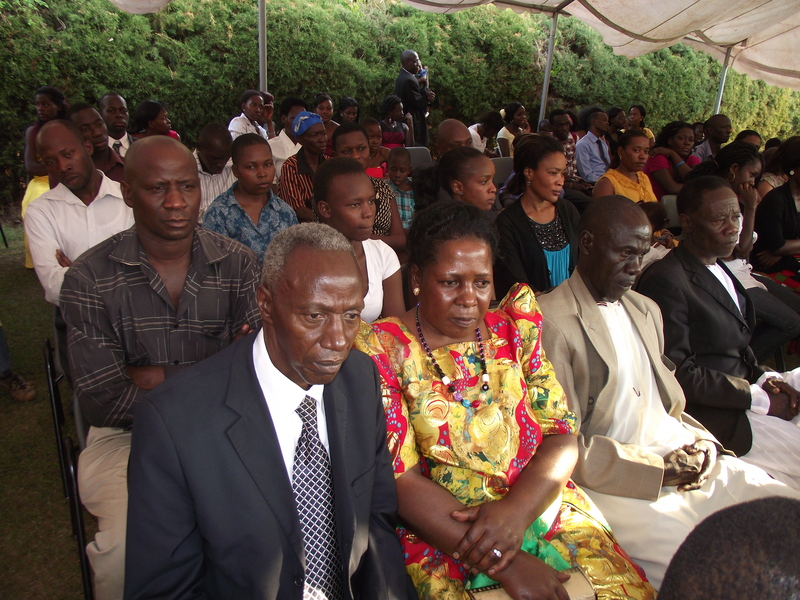 “The only person who can answer your questions is the Lord,” President Chatfield told us. You need to take it to him and that’s all I can tell you. He left and Joseph and I knelt, he took both of my hands in his and we prayed. As we did, I felt like a little girl again, listening to the deepening tones of my dad’s reverent voice as he prayed. I felt so loved and protected and like I could face anything that could come my way. I felt trust and love for Joseph like I had always felt for my dad. I thought about having children with him and how I felt confident that my children would look up to him with love and respect the way I had with my own father, and I knew that I would trust and respect him and support him in that role as well. I felt peace completely surround me. And then I thought. I am getting married in two days to a man I have known for a matter of weeks! 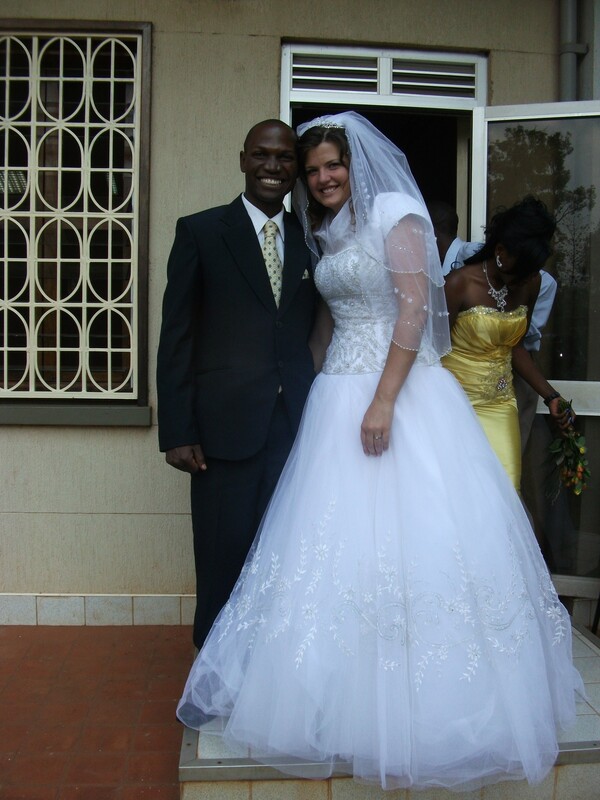 A man who no one in my family and none of my friends had ever met, I was marrying him in Uganda, in a strange country, completely alone and with out support. I was marrying a black man! In spite of how I had always felt and what I had believed about them. 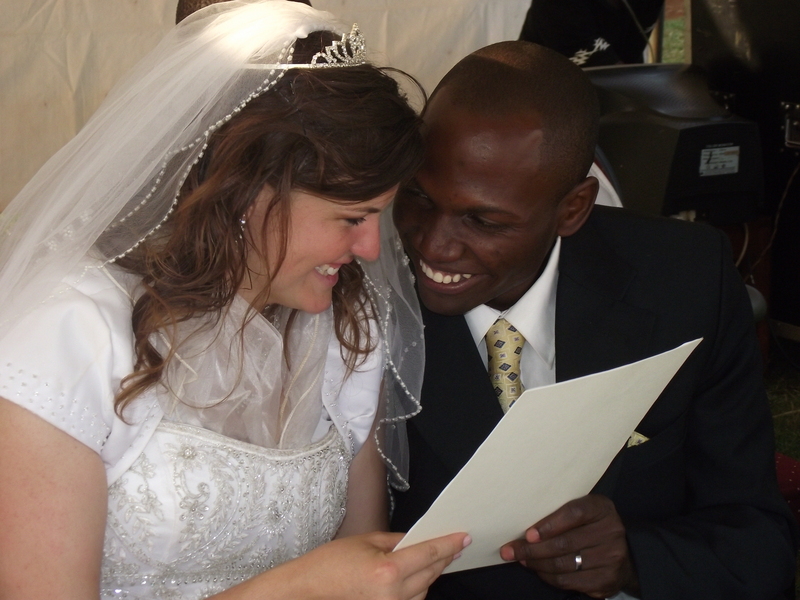 I was marrying a man much younger than I was, from an entirely different background and culture. Even his first language was different from mine. I had every reason to be panicked. I had every reason to feel overwhelmed and lost. But I didn’t. I felt loved, protected, secure, and filled with peace. I knew those feelings could only come at a time like this, so powerfully as to over come all other feelings, from one source. It was the final answer that I needed. The Lord approved, he was here in this very room helping me at this moment. And I knew everything would be ok. When Joseph finished the prayer I looked into his eyes hugged him and told him that I was ok. I knew we were making the right decision and that I was not going to back out. The day before the wedding I only saw Joseph for a few minutes in the afternoon. He took a break from setting up tents and chairs and making arrangements to come be with me for an hour or so. 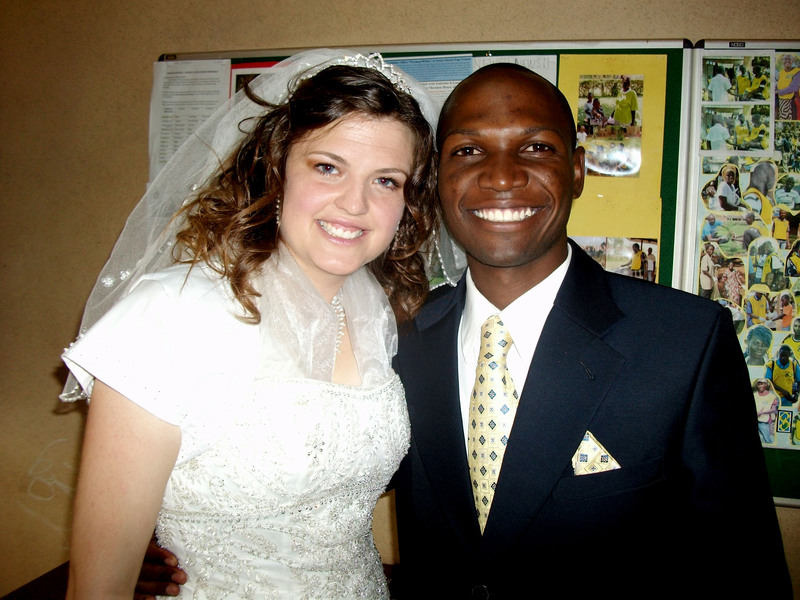 When we first started dating Joseph and I had set a couple of firm rules for ourselves to help us to make sure that we kept the standards that we believed in regards to physical intimacy being saved for marriage. Some of these rules were that we would never kiss lying down, we would save passionate kissing and necking for after marriage and we would never spend the night together in the same home by ourselves. 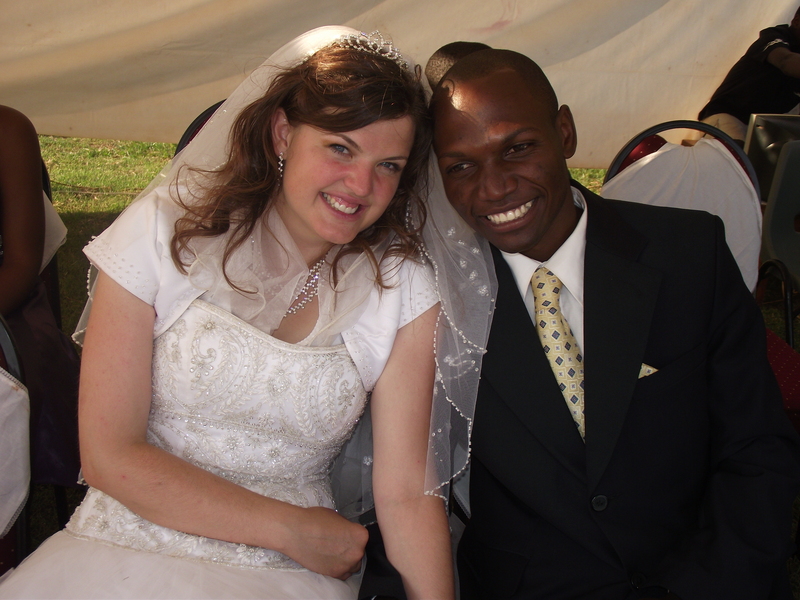 It was so nice to be approaching our marriage the following day knowing that we had stayed true to our convictions and had kept the rules that we made for ourselves. We had told no one of these rules and there was no one to judge if we broke them, but we knew and it felt good. That afternoon as we spent our last few moments together still “limited” by these rules and yet aware that our marriage the following day would change everything, we spoke to each other with loving words and I felt that my heart would burst with Love for him. I had no desire to do anything that would damage the special feeling that “waiting” had created between us. We held each other, talked of our plans for the future, and savored these final moments together as single people. 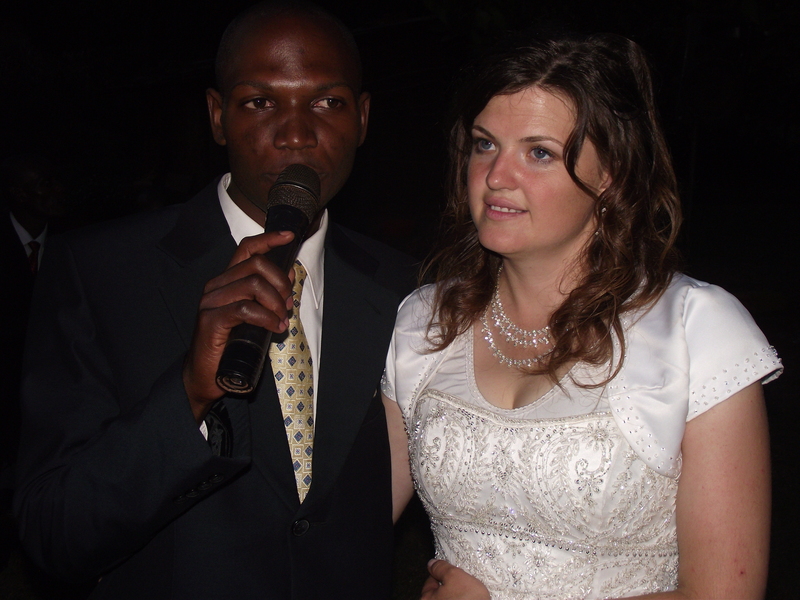 Later that night, Joseph’s sister Tinah met me at the hotel where we would be spending the night. She brought, my wedding dress with her, and all was set. The following day after a much-needed and incredibly enjoyable hot shower, Melissa, my only friend from the states who was there came and did my hair for me. I went to a salon and got my nails done and then waited patiently for the car to arrive to pick me up. I had warned everyone that my wedding would start on time! 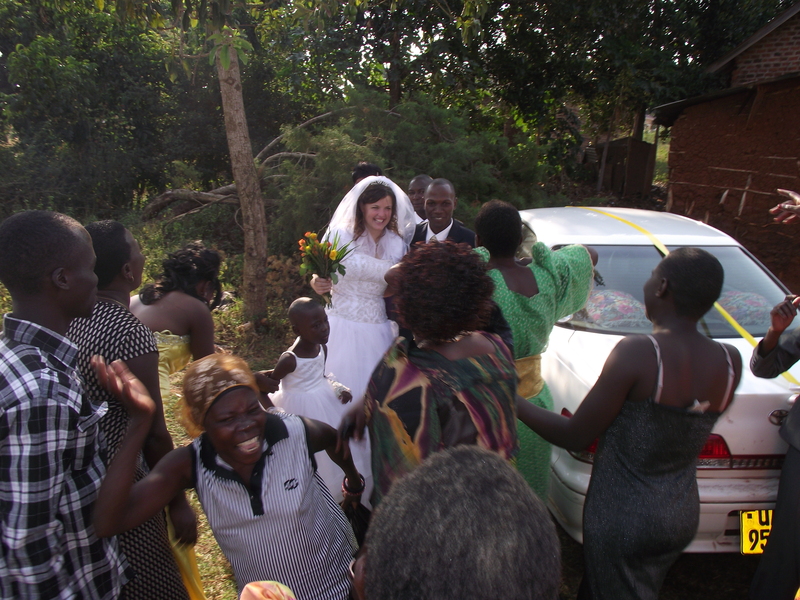 When the time came for the car to arrive to pick me and my brides maids up to take us to the church I was ready and waiting. No car showed up and the minutes ticked away. Finally I gathered my full skirts in my hand and told Tinah, “Im leaving. 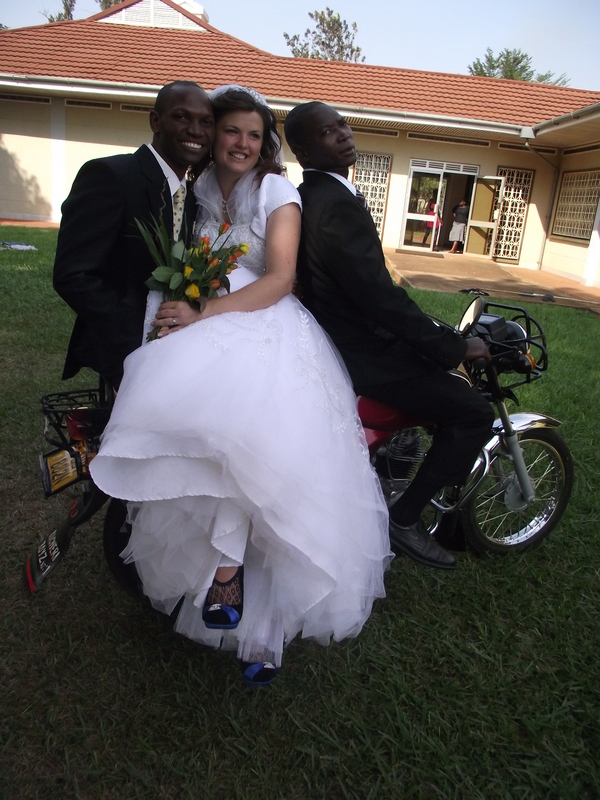 If I have to take a boda boda (motorcycle taxi) to the church I will but I am going to the church right now!” Tinah was frantic, you can’t do that she told me! She tried to call Joseph as I headed down the hallway squeezing my dress between the narrow doorways. They wanted to touch my hair and my skin, they sat quietly and shyly next to me. We arrived at the church about the time the wedding was supposed to start and I was like a crazy woman trying to get in to the chapel to make sure things happened just the way I wanted. Life rarely happens the way we want, you would think I would have figured that out by now and quit trying to control every little detail, but for some reason I wasn’t willing to just sit back and let this day happen. I wanted it to happen the way I wanted it to be. Joseph and I met in the hallway, My veil was over my face and through it he looked fuzzy and white. And oh so handsome in his dark suit and yellow tie. His eyes glowed in appreciation as he looked at me and he didn’t need to say anything, his eyes said it all. 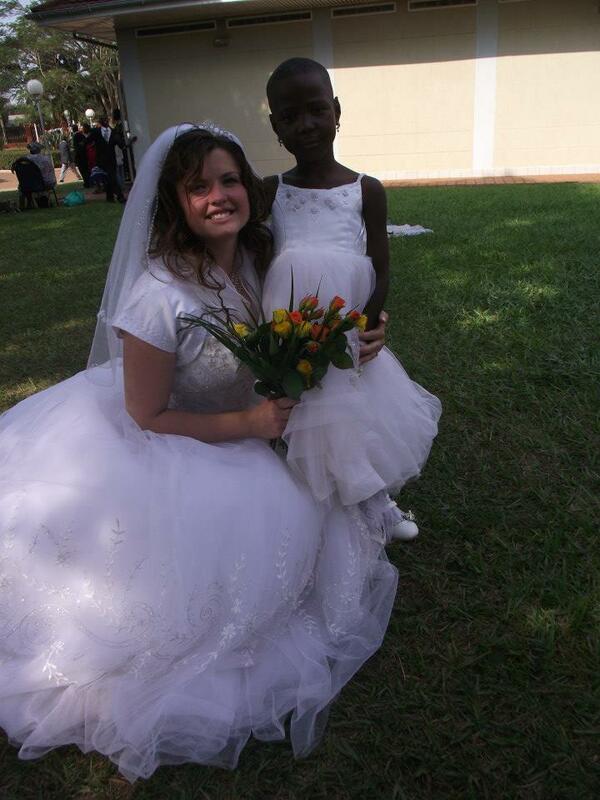 We posed for a few pictures together and then went to the chapel for the wedding. Every seat in the chapel was full, and some were even standing, but I didn’t notice. I was frantically trying to get my family on skype and get things ready so that we could start. 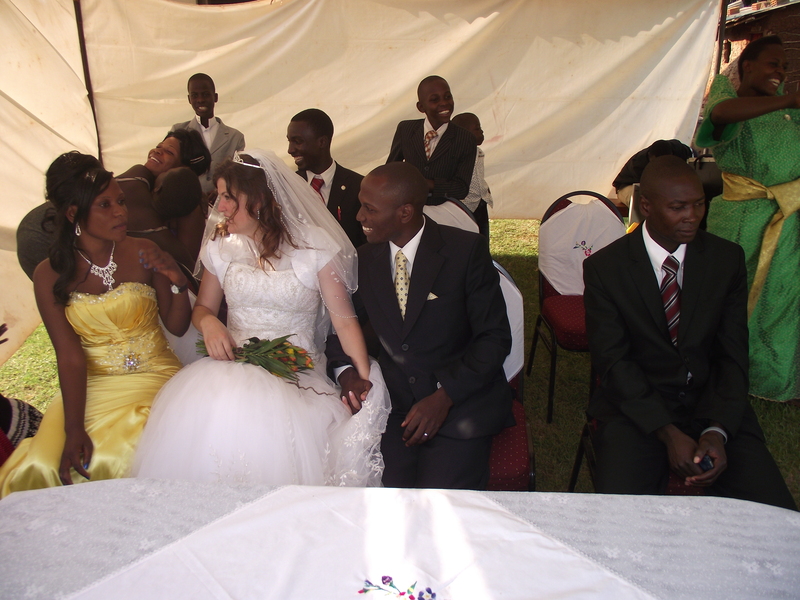 I was way too excited that my wedding day had finally arrived to be shy or nervous. 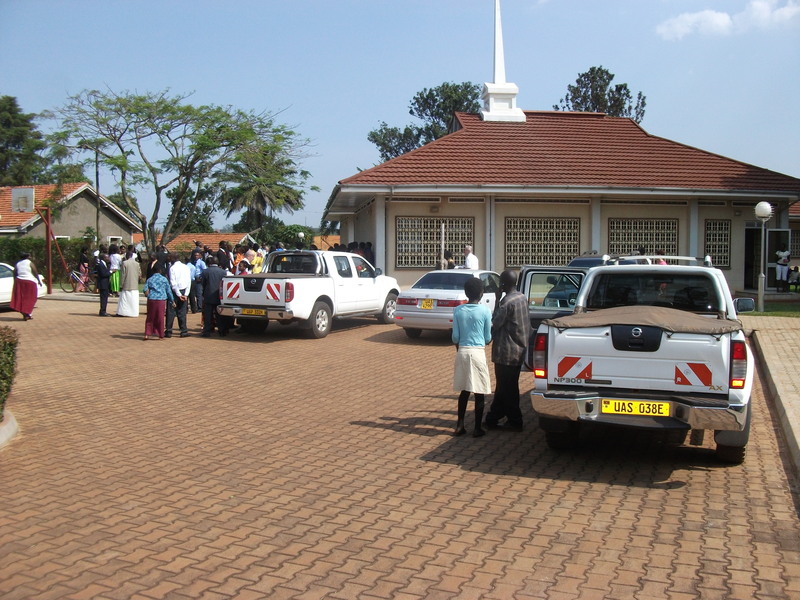 JInja Chapel, where Joseph and I were married. I finally got my family on skype and after a quick wave to their sleepy faces (it was 3 AM their time) the ceremony started. They started by singing a song that had always been a sore spot with me. And was especially so on this day. I sat there trying not to think about my mom and my sisters watching silently over skype as I took this step. I tried not to think of the spiritual, temporal and physical separation as what I was doing further widened the gap between my family and I. I tried not to think of my own father who I loved so dearly, not even able to be there on this most important day for me. It didn’t work and before I knew it I was sobbing and gasping for breath in my fitted dress. My whole body was shaking uncontrollably. Finally the song ended and the branch president spoke for a few minutes. 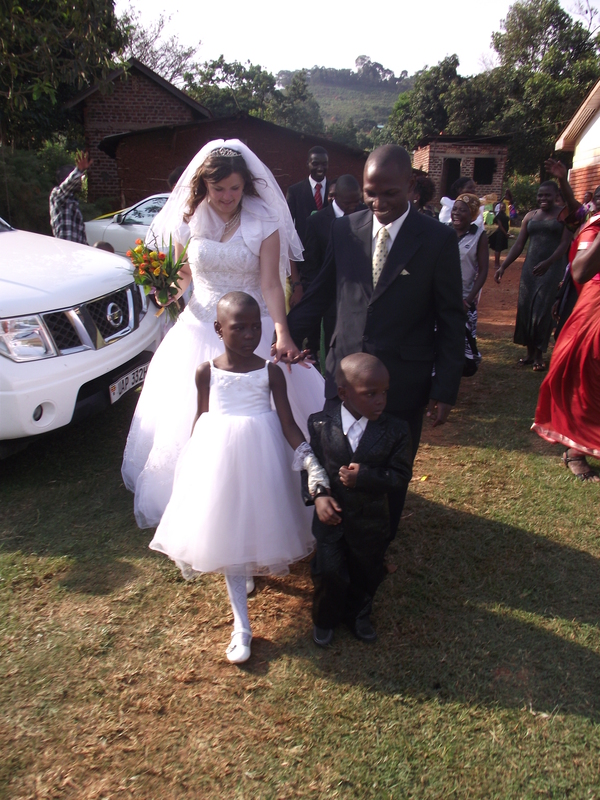 When he finished he asked Joseph and I to stand, we stood facing each other and holding hands. Joseph’s head was down and I longed to see his eyes. I wanted to see if he was still sure, I wanted to see the love that I knew would be reflected there. He didn’t look at me. As the Branch President spoke I leaned down a little trying to catch his eye. It worked for a second, just long enough for me to see that he was really nervous. When it came time for him to say Yes, he did and when it was my turn I said it, wishing it was a longer word, or that there was some way to capture the significance of the moment. 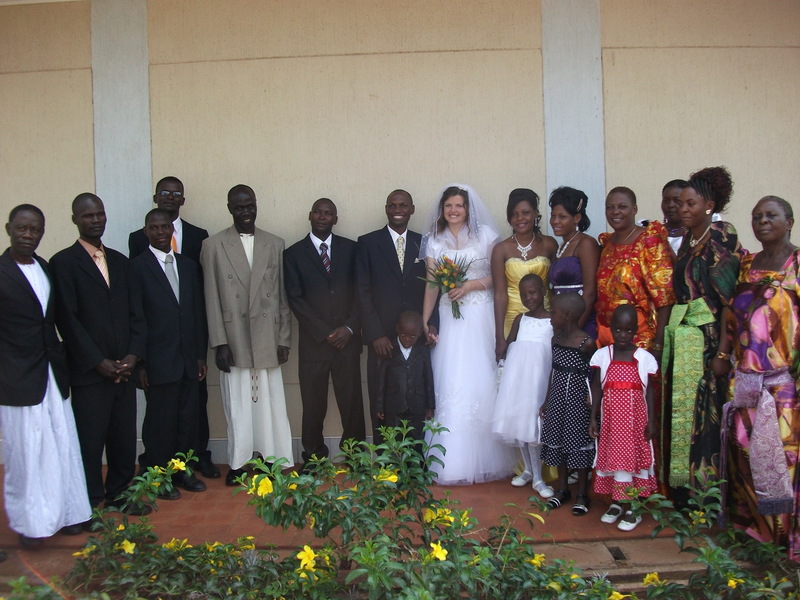 Then, it was done we were married, Joseph kissed me for the first time as his wife and we headed for the door with his family and friends yelling and shrieking behind us in the unique way that women in Uganda celebrate the marriages of their loved ones. As we stood outside the church taking photos with friends and family, I couldn’t stop smiling, the peace and contentment that I had felt in the last few days leading up to this day remained and was intensified by the contentment of knowing that I was finally married. I didn’t feel a rush to get through the reception, I didn’t feel anxiety about anything. All I felt was utter and complete contentment in that moment. Joseph squeezed my hand and I wondered if I would ever again need to see any face besides his. When the pictures finished we moved on to the reception. As the day progressed there were moments of surprise when something didn’t happen the way we wanted it to, there were moments of frustration where too many people were telling us what to do, where to stand, where to look, too many hands were pulling, hugging, fixing this or that. Music was playing to loudly and too long And for a few seconds I thought I would scream. Then the moment would pass and the contentment would flood in again and I would remember that it was my wedding day, a day that would never come again, a day I had waited 32 long years for. This cycle of feeling frustrated and overwhelmed and being so in love and reveling in the joy and the beauty of the day continued. As Joseph and I sat front and center at a table beautifully decorated for us, surrounded by hundreds of people who had come to celebrate with us, I felt that life couldn’t get any better, and as my head pounded with the noise and the craziness of the day as the hours wore on I turned to Joseph, “I can’t do this, anymore” I told him. “You have to deal with it, its as simple as that” he answered, smiling yet again as someone else hugged us and someone else pulled on our arms trying to tell us that we need to speak, or take a picture, or accept a gift. Finally I had truly had enough, The music was pounding in my head and all around me and my large personal space bubble had been invaded one too many times. I wanted to scream and run away from it all. Someone was yelling in our ears, trying to be heard over the music, telling us what to do and someone else was contradicting them in the other ear. I gathered my skirts in my hands and walked as fast as I could toward the road, leaving Joseph and everyone else behind. I didn’t know what I planned to do when I got out of the yard and to the road, I just knew that I couldn’t take one more minute. Joseph ran up behind me, shouting for someone to bring the car. He seemed angry with me. We are going right now he told me. We got in the car with three of Joseph’s friends and drove out of the yard. 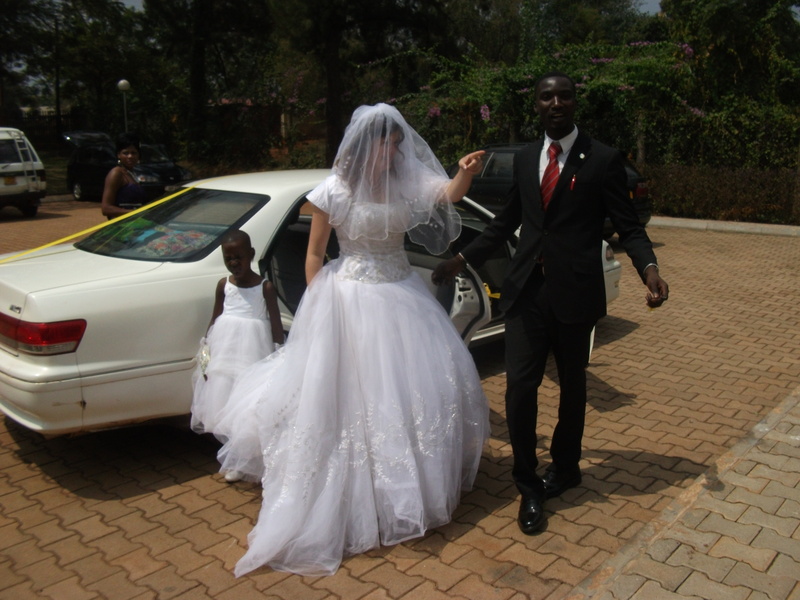 Just as we were pulling out on to the road I remembered that my clothes, everything except my wedding dress was in a suitcase with Tinah. Joseph, we have to go back, I said, I need my suitcase. Again he seemed upset but drove back. I tried to get out of the car to go get it. Joseph told me to stay put and he would get it for me. I couldn’t very well tell him in front of his friends that I needed Tinah’s help to help me out of my dress and into something more romantic underneath for our wedding night. And Joseph wasn’t listening besides. “Would you just stay here!” His voice was harsh and angry sounding, something I had never heard from him before. I was mad that his friends were in the car with us, mad that the reception had ended the way it had and madder still that my husband had been gruff with me. I sat on my side of the car with my dress piled around me. Ignoring Joseph and his friends as they talked. They unloaded our gifts at our apartment and then took us back to the hotel where we would spend the night. We unloaded our things and they left. I sat on the bed furious and near tears. Joseph came into the room after seeing the boys off. His smile back on his face and his eyes happy as though nothing had happened. He walked to me and put his arms around me. I pushed him away. He was not going to pretend that nothing had happened! 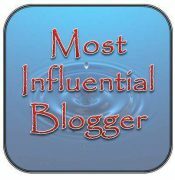 Before I knew what was even happening I was seated on one side of the bed and Joseph on the other, our backs were to each other and the gulf between us seemed unbreachable. I looked around to see if there was a tree near the window, thinking ironically of the scene from 7 brides for 7 brothers where Millie dooms her new husband to sleep in the tree on the night of their wedding. Is that how this night was going to end? I felt stuck and I didn’t know who to even blame! Technically the only thing Joseph had really done to make me angry was to get a little short with me. The only thing that anyone else had done to make me angry was to try to make my wedding day perfect. I didn’t know why I was so mad and I didn’t know how to fix it. I wanted things to be good between Joseph and I but I felt like just ignoring how I was feeling would just put a band-aid over the issue. I closed my eyes and said a little prayer. Father, I prayed, I feel like this is my fault. Can you show me how to fix it? “You can start by getting on the same side of the bed.” The thought came clearly to my mind and should have been a no brainer. Joseph, I said, meekly. Will you come sit by me? I couldn’t lie and tell him that it had been perfect. I was too honest a person for that and he would see right through me and it would mean nothing. I sat silently for a few minutes. I thought again of another story, this time from a book instead of a movie. In the work and the glory, shortly after a young couple marries, the husband is feeling dejected because he sees the conditions his wife is living in and feels that he is putting her through too much. She sees what her complaining has done and fixes it by finding things to be grateful for and the two end up laughing over their own difficulties. It gave me an idea. “Oh and I loved when your mother told me that I was her daughter now!” I said, the feeling of making a game out of this catching on. “I am” he smiled then you succeeded, you made our wedding day, perfect. I told him, meaning every word. He kissed me and bridged the final steps in the huge gulf that had separated us just moments before. 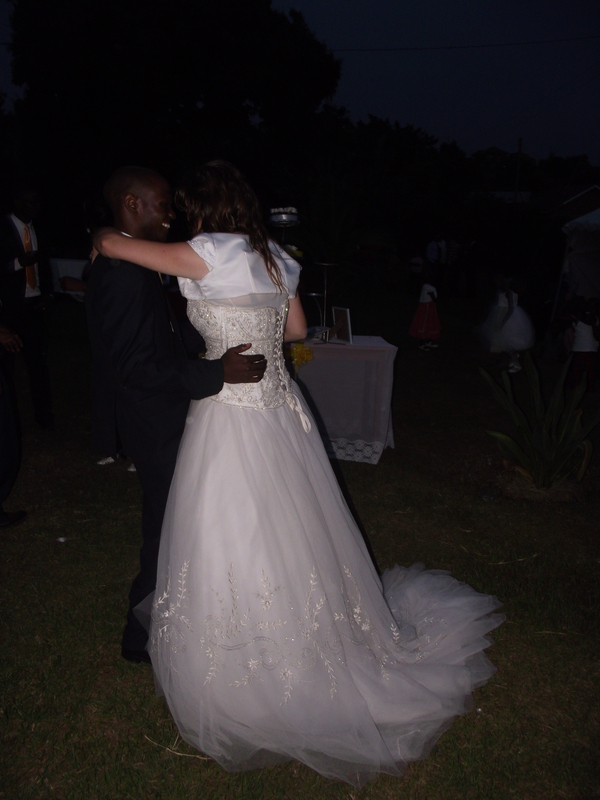 And so my whirlwind romance turned into a marriage. A marriage that would see, difficult times, a few arguments here and there, a baby sooner than anyone could have expected, and a separation that would only increase our love for each other. Who knows what still lies in store for us. Because just as Brother B had told me years before, this is not the end, it is only the beginning! 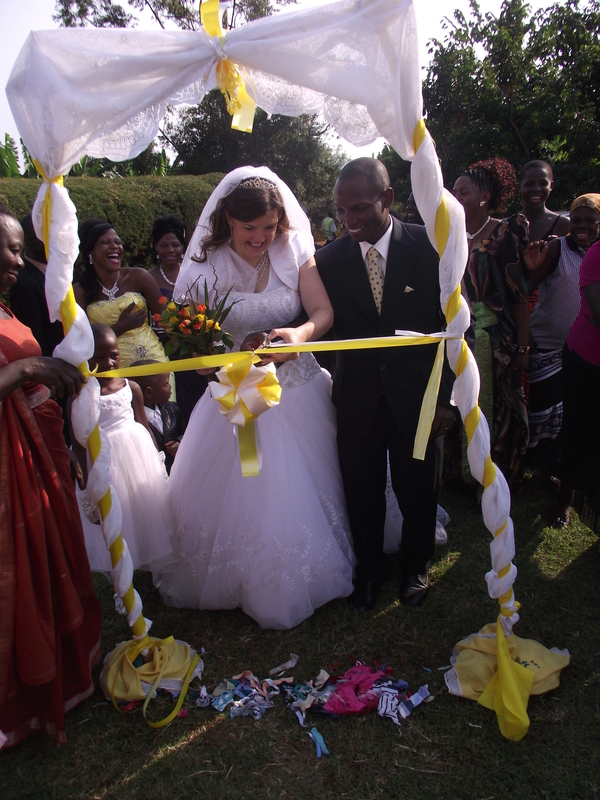 This entry was posted in Family, Inspiration, LDS temples, Mormons, My Whirlwind Romance, Relationships, Uncategorized and tagged 7 brides for 7 brothers, craziness, culture, family, the work and the glory, tradition, Uganda, wedding day. I love your writing style. I eat up every word of your beautiful story!! Ahh thats very kind thank you!